Honored and deeply on fire by my conversation with Synereo CEO Dor Konforty. How would a bioinspired cryptocurrency look and behave? Exciting stuff! 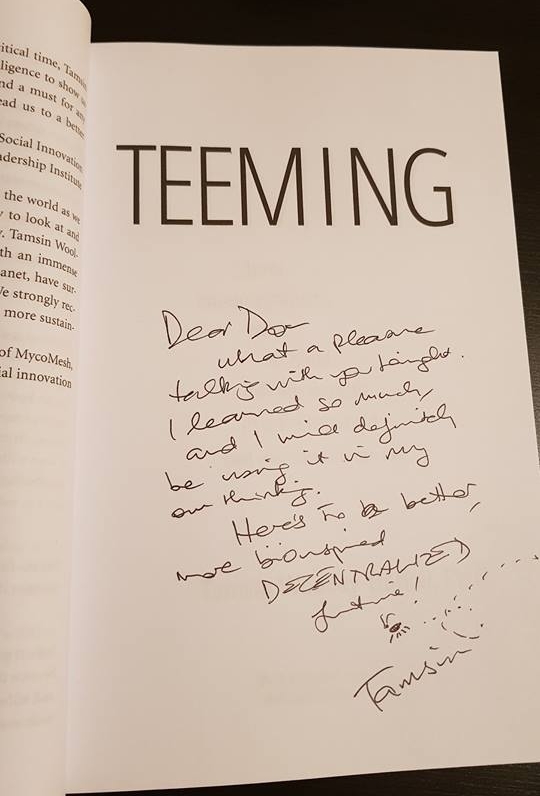 "Had a stimulating discussion with Dr. Tamsin Woolley-Barker, a biomimicry expert, about what we can learn from how nature organizes itself - whether ants, apes, or neurons in the brain - and apply for the social order, tech-assisted collaboration, and the path of liberation. It's all about increasing the degrees of freedom allowed and available to the nodes in a network by facilitating their ability to communicate and dynamically organize or by removing barriers and inhibition through the elimination of their reliance on centralized entities. A more complex order emerges through the greater option-space, and it tends to serve its constituents better. Open questions: can the conditions conducing to the creation of a beneficial meta-layer on top of a flat, p2p structure be quantified? Can the characteristics of such a meta-layer becoming over-adapted and/or harmful be defined? Thanks Tamsin! I got my first dedicated and autographed book today. Hurray"
Newer PostSummer Reading List for Biomimics!